July 6, 2012 – Sun Valley, ID, – After starting 3 minutes behind the U23 field, Keegan Swenson stormed through the majority of that group to a dominating victory for the national championship title in the Junior 17-18 field. The race today was held on the same demanding course the Pros will race on Saturday. Swenson's lap times were reported as faster than the leaders of the U23 race, although the Juniors raced 4 laps while U23 raced 5. Each lap Swenson came through looking relaxed and powerful up the 15-20% climbs. He descended the rock fall comfortably each lap as he gapped his competitors and overtook many of the U23 racers. Boise's Grace Alexander won the Junior Women's 17-18 National Championship. Results will be posted here. 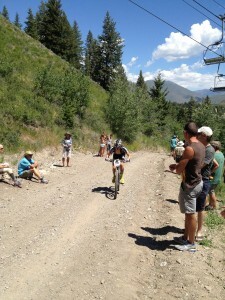 One Response to "Utah’s Keegan Swenson Wins 2012 Junior National Cross Country MTB Championship"
Oh yeah Keegan! Nice work.